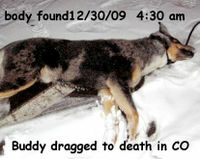 We the undersigned urge the court in Denver, Colorado to give Steven Clay Romero, the man charged in the dragging death on December 30, 2009 of a German Shepherd named Buddy behind his truck for three miles the maximum penalty of three years in federal prison, $100,000 fine and one year probation for this horrific crime. Do not let this crime go unpunished for the horrible death of an innocent dog. Given Mr. Romero's past criminal record, we feel he is a menace to society and this dragging death is only the beginning of what could lead to future unimaginable and tragic consequences.